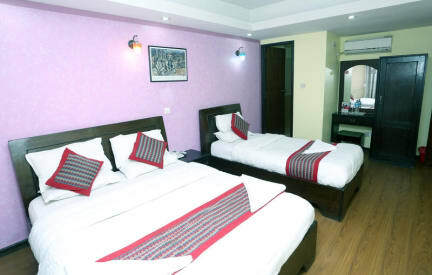 Hotel Kathmandu Home is nestled in a peaceful and leafy setting of the ‘Tourist Hub’ of Nepal, Thamel. It is an art-deco budget hotel offering rooms of spectacular opulence and 5 star rated services. It is a 3-minute walk to the strategic shopping zone that offers multi cuisine restaurants, trekking gears, souvenirs, discotheques, bookshops, ATMs, money exchange etc. We are proud to announce that we strive hard to continuously provide our best services and complete satisfaction. It offers 2 comfortable suites room, each with bath tub and kitchenette for your family. 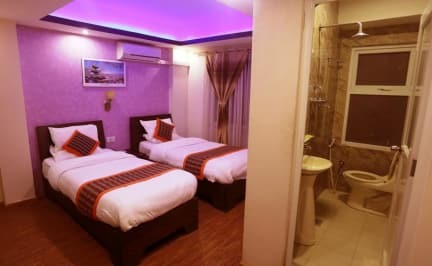 It also provides 8 standards, 12 deluxe rooms and 3 triple deluxe rooms with complete modern amenities to serve you better. We have unlimited Wi-Fi, hot water, LCD TV and a sumptuous Nepali or western breakfast, waiting for you.